The Coastal Lagoon Critical Habitat, officially known as the Las Piňas–Paraňaque Critical Habitat and Ecotourism Area (LPPCHEA) was established By virtue of Presidential Proclamation No. 1412 dated April 22, 2007. On January 31, 2008, Presidential Proclamation No. 1412 was amended by Presidential Proclamation 1412-A which directs all relevant departments and instrumentalities under the executive branch to ensure the preservation of existing mangrove, mudflats and ecosystems in the area that supports natural ecological functions. It also directs the DENR to convene and chair a Manila Bay Critical Habitat Management Council. The Coastal Lagoon Critical Habitat is located on the western side of the Aguinaldo Highway (Coastal Road) and is bounded on the north by the Paraňaque River and on the South by the Las Piňas River. The Coastal Lagoon Critical Habitat covers an area of 175 hectares. It consists of around 30 hectares of mangroves with 8 species which is the most densed mangrove area within the Manila Bay. Adjacent to the mangroves are mudflats of about 114 hectares. These mangroves serve as roosting and nesting of birds while the mudflats serve as feeding grounds. The Philippines is a signatory to the Convention on Biological Diversity (CMS). The Coastal Lagoon Critical Habitat is a conservation area for biodiversity consisting of 8 species of mangroves and more than 50 species of birds. 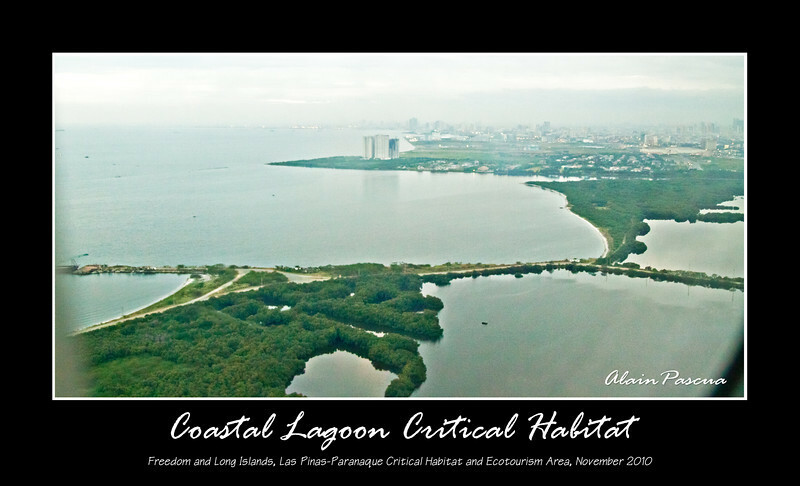 The Coastal Lagoon Critical Habitat is the last intact ecosystem of such kind along Manila Bay and in an urban setting. The Philippines is a signatory to the Convention on Migratory Species (CBD). The Coastal Lagoon Critical Habitat is the first and only critical habitat ever proclaimed in the country and hosts more than 5,000 individual birds during migration season. At least 1% of the population of Greenshank and 10% of the population of Black-winged Stilts in the East Asian- Australasian Flyway are in the Coastal Lagoon Critical Habitat. The Philippines is a signatory to the Ramsar Convention (Wetlands Conservation). Most parts of Manila Bay are wetlands which is a very productive ecosystem. The Coastal Lagoon Critical Habitat is part of a complex coastal ecosystem and very sensitive to changes in its surroundings. The presence of a considerable number of birds in the area makes it a wetland of global importance. Hi. I would like to use your photos for a presentation in UP on LPPCHEA as a potential case for a wetland park in the Philippines. You will be properly cited. I can send a copy of my presentation to you afterwards, if you would like. Thank you!